cocktail punch recipes are easy to make. The holidays are coming and that means getting together with family and friends and enjoying a little holiday cheer. What better way to greet your guests than with a cup of punch. 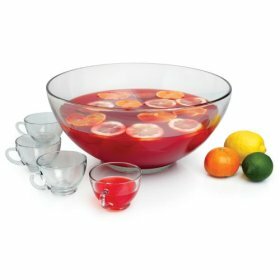 A great advantage of having a punch bowl for you next party or dinner is that you can prepare it in advance. This warm party punch from Manhattan bartender Jane Danger packs some added heat with a spicy jalapeño and rum honey. But chile-phobes shouldn’t fear: the heat of the spiced honey is not at all overwhelming; “in fact it’s very light and warming,” Danger notes. On a stove top, heat all ingredients together until steaming. Ladle into mugs and garnish. To make the jalapeno-rum honey: Combine 1 1/2 cups of honey with one sliced and smashed jalapeño (seeds intact) and two ounces of rum. Stir and let sit overnight at room temperature. Remove the jalapeño chunks before using. Store in a dark, cool place for up to one month. Makes approximately 6 servings. Wassail is a staple throughout the cold-weather season in many parts of the upper Midwest. Every winter as the holidays approach, many people take part in the age-old “wassailing of apple trees,” a ritual dating back to the fifteenth century that involves sprinkling wassail on apple trees to ensure a strong, healthy harvest and to keep the trees safe from evil spirits. Wassail always blends apples and winter holiday spices, but the sweeteners and spirits often change from recipe to recipe. To make the wassail: Wrap the cloves, allspice, ginger, cinnamon sticks, and peppercorns in cheesecloth and tie with kitchen string. In a large pot, heat the cider, cranberry juice, brown sugar, and spice bag. Bring to a boil, then reduce heat and simmer 30 minutes. To make the drink: Add 1 oz. of bourbon or brandy to a mug and fill with hot Wassail. Garnish with a dusting of the nutmeg and the cinnamon stick. When the weather turns cold, mulled cider is a tasty warm beverage that’s guaranteed to warm you. It’s a great drink to share with friends on a cold winter nights. Combine all ingredients in a saucepan over medium heat and bring to a low simmer. Lower the heat and continue to simmer gently for 30 minutes. Ladle into 4 mugs and serve steaming hot. 1. In a punch bowl, combine sugar, orange juice, and lemon juice. Stir until sugar dissolves. Add cherries, triple sec, light rum, orange slices, lemon slices, and pineapple chunks. Refrigerate for 1 to 2 hours to allow flavors to blend. 2. Pour in carbonated water, and add ice just before serving. Fruit punch is traditionally made in Africa with lemon, orange, pineapple, and guava juice. While you may wish to find a can of each juice, I find the frozen guava/raspberry concentrated juice to be the best choice for any occasion in America. Decorate and keep the punch cold by floating frozen orange slices, stemmed cherries, frozen pineapple slices and a frozen molded cranberry juice ring in the middle of the punch. Make half the punch at a time if the punch bowl you are using is small. This is the best cold punch for a summer wedding. Pour the frozen juice concentrate into a large punch bowl. Stir in the water. Add the ginger ale and sparkling juice. Carefully lower the frozen cranberry ring into the punch. Float the orange slices, cherries and pineapple in the punch. Add the extra cranberry juice as the punch gets depleted. Previous Previous post: Is Bartending School Worth It?